It’s highly unlikely that the world has been waiting for a concert recording from Simon & Garfunkel. But that’s just because over the years the duo has become one of the forgotten gems of the 1960s. Not to mention the fact that no one really expects Simon & Garfunkel’s concerts to vary all that much from its studio endeavors. Such an assumption, however, would be completely wrong, and that’s why Live from New York City, 1967 has been a long time in coming. In fact, it’s more than 35 years overdue. At the time of the concert (January 22, 1967), Simon & Garfunkel were between masterpieces. Parsley, Sage, Rosemary, and Thyme had come out several months prior, and Bookends wouldn’t be released for more than a year. Between the two, Paul Simon’s lyrics explored the alienation that was growing between his generation and the establishment. A distrust of government, a dislike for business, and a general disillusionment with the state of America provided plenty of fodder for his poetic observations. 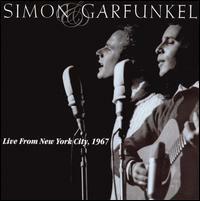 If anything, Live from New York City, 1967 further plays to the lyrical essence of Simon’s songs. Make no mistake: The studio renditions of these tunes all hold their own against and build upon similar outings of the time, such as The Beatles’ Sgt. Pepper’s Lonely Hearts Club Band, Rubber Soul, and Revolver albums as well as The Beach Boys’ Pet Sounds. But with just two beautiful, perfectly joined voices and masterfully performed guitar passages, a crystal clear clarity is achieved that allows the words to hang in the air, forming delicately silhouetted snapshots of life. Listen as the duo depicts the disengaged couple in The Dangling Conversation or paints the subway with A Poem on the Underground Wall. Listen as they gleefully glide through the free-spirited 59th Street Bridge Song or tell the sad tale of A Most Peculiar Man. As an added bonus, the set list for the 1967 concert from which this album is taken included two rarities: A Church Is Burning and You Don’t Know Where Your Interest Lies. The former is an essential track that portrays a vivid illustration of the religious, spiritual, and racial turmoil of the late ’60s and had appeared on Simon’s 1965 UK-only, solo effort. While the latter song was eventually recorded by the duo, it also was banished to the B-side of Fakin’ It, no doubt due to its similarity to the far superior A Hazy Shade of Winter. Nevertheless, its inclusion here does provide some insight into the writing and performing process that Simon & Garfunkel utilized. In the end, however, it’s all about the songs, and as evidenced by the magnificent music contained on Live from New York City, 1967, Simon and Garfunkel had them in droves. Live from New York City, 1967 is available from Barnes & Noble.